I made a difficult, but exciting decision late last school year. I decided to teach part time this coming up school year, and leave the role of a fifth grade teacher which I've adored for almost a decade. My attachment to my position is understandable I think. I teach at the same school, and in the same classrooms that I was taught in as a child. I teach alongside some the hands down best teachers in America, and I really love fifth graders. This is probably the most shocking part since, "Fifth graders are so sweet and cute," said no one EVER. Despite the word on the street, they are really special and interesting little grown ups. Needless to say, this is a big change for me. Mommy and Me Mondays are one of the reasons why I made this decision. No, not so I could write blog posts about activities to do with your toddlers, but to really be more present in some wonderful years with my son. My husband and I were both raised by working mothers (both teachers), and spent very valuable time during our childhood with them. This was a selfish decision on my part to be a more equally balanced mama! There are millions of moms and dads that know how challenging finding a balance is, and we all get to a point where we have to think what is best for ourselves, our families, and our profession. It's a perfect balance too for our son. He is a very social child, who loves to explore and learn. Now he gets the joys of preschool and to have me as a teacher too (lucky him...wink, wink!). Since school started for him a couple of weeks ago, we are following the school's learning themes at home too. This month they're focusing on back to school basics, friendships, and family. We jumped on board with a shape and alphabet activity. We've been pointing out shapes around us for awhile now, so we put our knowledge to use. My son helped me hunt around the house for two circles (one for the apple and one for the leaf). I would point objects out to him and ask, "Is this a circle?" I love to hear him say, "No, mama." Well at least I like to hear that sometimes. I traced the circles with his "help" and cut them out along with some rectangles. The different sized rectangles would act as our apple tree trunk and branches. Once all the apple tree pieces were cut, the Brusier helped me lay them out to resemble a tree. He practiced his fine motor skills by using a glue stick (and his tasting skills...I don't know what it is about glue and kids). If you look closely, some of the apples even have glue on the front side too! He giggled when I held up the little circles and cut them in half to make green leaves. 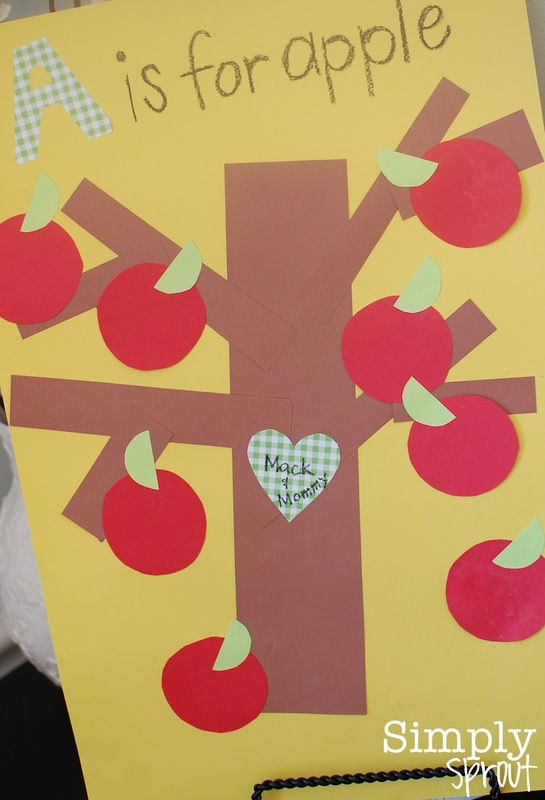 We finished our apple tree off with a big A, pointing out words that started with the short a sound, and a heart full of love. We're looking forward to many more Mommy and Me Mondays together. But remember, quality mommy and me time can happen any time of day, any day of the week!